Christopher Chase, a founder of the firm’s Sports Industry Group, is an intellectual property and transactional attorney for the marketing and entertainment industries, with a specific focus on the sports and event sectors. Chris routinely counsels major sports leagues, teams, and governing bodies on intellectual property, branded entertainment, and promotional matters; advises both sponsors and properties on the structure and negotiation of sponsorship and endorsement arrangements; counsels agency clients that activate sponsors’ marketing campaigns (including for major events such as the Super Bowl, World Cup, and the Olympics); advises major sports apparel, footwear and fitness companies on marketing campaigns and intellectual property matters; and advises high profile athletes on their on-field and off the field activities, including endorsements, appearances, film and TV production, trademark development, brand protection, and transfer agreements within Major League Soccer. Chris also has a strong knowledge of Major League Soccer and National Women’s Soccer League rules and regulations and has assisted with player transfers, sponsorships, endorsements, and investment and ownership advice. A frequent speaker and prolific writer, Chris has been a go-to source on several sports industry topics for a number of significant media platforms, including Sports Business Journal, the Associated Press, USA Today, Washington Post, New York Times, Chicago Tribune, L.A Times, and Fox Business. 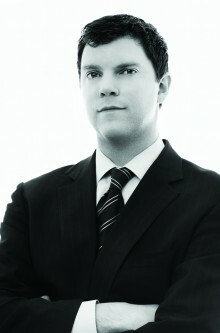 Within the broader advertising and entertainment industries, Chris counsels entities and individuals in the advertising and entertainment industries on all aspects of their businesses, including rights clearance (such as copyright, trademark, and rights of publicity), regulatory matters, and risk assessment. He structures and negotiates creative services agreements, commercial production agreements, brand and celebrity licensing agreements, sponsorship and event promotion agreements, celebrity talent and on-camera agreements, content distribution agreements, media agreements, and content releases and licenses. He also counsels clients regarding potential and actual litigations arising out of commercials, print advertisements, sweepstakes, contests, and other promotions, magazines, films, television productions, and websites. Further, he has vast experience addressing music issues, including structuring and negotiating master use and sync licenses for commercials, video games, television productions, and films, music distribution agreements, artist/band services, appearance, and promotion agreements, and concert sponsorships. Chris began his career as a litigator at Clifford Chance Rogers + Wells.